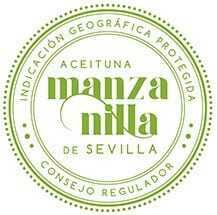 Manzanilla and Gordal Olive from Seville have been granted a transitory Spanish protection as Protected Geographical Indications (PGI,) the stage preceding their final admittance to the European Union’s registry of quality indications of origin. The determination follows Andalusia’s Department of Agriculture, Fishing and Rural Development’s approval of the bylaws that will rule the Regulatory Council responsible for guaranteeing the quality and origin of these two PGIs that protect extra and prime quality table olives from Manzanilla and Gordal varieties from an area demarcated by 105 municipalities in the province of Seville and eleven in the province of Huelva. Seville is the world’s top producer of table olives and the producer of 75 percent of Spain’s table olives. The province also concentrates the production of Gordal and of the majority of Spain’s Manzanilla production. A very appreciated variety, Manzanilla has a round form, a pale color, a rather small size, thin skin and a good food pulp/stone ratio. It is symmetrical, and its pulp is easily separated from the stone. Gordal is larger in size, asymmetric, has an ovoid shape and much more pulp, albeit less oil content which makes it very apt for Seville-style dressings. Manzanilla Olive from Seville and Gordal Olive from Seville are the green table olives from these two varieties, dressed in the traditional manner of their geographic region. Green olives dressed in Seville-style brine could be of three kinds: whole olives, pitted and stuffed. Olives are hand-picked through “ordeño” system (hand picking each olive, one by one) before they are ripe, to prevent damage in the fruits. The suitable olives are then selected and classified according to their size, prior to being dressed Sevilla-style and washed. Preservation and storage based on whether they are whole, pitted or stuffed table olives follow and conclude the process. The route towards a PGI began in 2014 with the creation of the Association for the Promotion of Manzanilla and Gordal Olive Varieties from Seville. This group was constituted by key olive companies to promote and protect the olives from Seville and these two varieties in the Spanish and international markets through the enhancement of their distinct identity based on quality and tradition. Their intention to establish a PGI for Manzanilla and Gordal from Seville’s olives was opposed by ASEMESA (Spanish Association of Exporters and Industrialists of Table Olives,) responsible for the production and commercialization of the majority of Spain’s table olives and also of table olives from Manzanilla and Gordal varieties. ASEMESA claimed that the new PGI would limit and restrict rights that for a long time had belonged to the entire table olive sector and would impact Manzanilla olives grown and produced outside of Seville, Manzanilla olives grown in Seville that did not comply with the stipulations of the new PGI, and olives from other varieties grown in Seville. In October 2017 these claims were dismissed by Andalusian courts, allowing the creation of the PGI to prosper. The European Union allows member states to grant a transitory and national protection to a PGI. This transitory status will be in effect from the moment of the application to the European Commission until the moment in which the registration is either confirmed or withdrawn.